The Second Ecumenical Council took place in Constantinople in 381 AD, and is also known as the First Council of Constantinople. Regarding the teaching of the Holy Spirit, the Council affirmed him to be God "even as the Father and Son are God: who proceeds from the Father, who with the Father and the Son together is worshipped and together glorified." After about 381, Arianism ceased to be a relevant issue, save for a few remote parts of the empire. 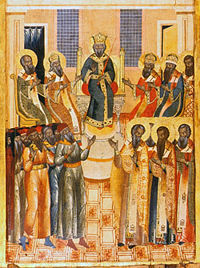 The controversial aspect of this Council was Canon III, which gave Constantinople second place in honor among the sees. They called it the New Rome. Rome and Alexandria both resented this, and feared that a power play might come into effect by Constantinople. In fact, Rome ignored this canon entirely until AD 1215, after the Great Schism, and even then there were political reasons for Rome's 'granting' of Constantinople second place in honor. Alexandria, formally second in honor among the sees, was first in honor in the Eastern sees. With the third canon, it became third in honor among the sees, and second in honor in the Eastern sees. Alexandria played a part in this sharp conflict between it and Constantinople, and while there was political maneuvering on both sides that saw the deposition of two bishops of Constantinople, there was more at stake as we approach the Third Council. The Holy Fathers of the Second Ecumenical Council are commemorated on May 22 and also on the 9th Sunday after Pentecost, with the Sunday of the Fathers of the First Six Councils. Commemoration of the Holy Fathers of the Second Ecumenical Council – OCA website. This page was last edited on October 18, 2015, at 22:25. This page has been accessed 54,169 times.